Matchmakers or Heartbreakers: is online dating the best way to find love in the 21st century? In recent years the global search for love has made its way online, with one survey showing that two out of five single Americans aged between 24 and 50 have used online dating sites. As the shift to an internet love-hunt grows, with people everywhere settling in front of their stylish new Asus Laptops to look for The One, many are wondering whether online dating really works or if it’s just another way to get our money. There are plenty who are prepared to argue that online dating is the best way to meet your perfect partner. Effectively a catalog of single-and-ready-to-mingle men and women, online dating opens up new possibilities for meeting people you would never otherwise have stumbled across. With the increased choice comes the benefit of being able to make informed decisions about who you meet. Unlike blind dates set up by sympathetic friends, with e-dating you can check out someone’s profile to find out their quirks and interests and to screen out undesirable traits. For party animals meeting someone in a bar might be relatively easy, but for the rest of us online dating spares you the stress of trying to find someone spontaneously. Safety isn’t always a certainty, however. You can’t know for sure if the person you’re speaking to is being honest about themselves. The lie may be something as trivial as a profile picture from their hey day, or a carefully tailored list of interests that doesn’t remotely reflect reality. In more serious cases, though, the risk may be greater, and the possibility of being misled by someone with unpleasant motives is a real one. There is also the risk of information overload. With pages of profiles to fill, people often share too much information, alienating users they could have a great connection with in person. If you meet someone in a bar, differences of opinion on popular culture can be dismissed because of the chemistry between you, something it is difficult to measure behind a computer screen. Of course, if you do find that connection, there is the stigma of having met someone online to deal with. While the earlier stats prove that this is an increasingly popular way to meet your partner, there are still unpleasant stereotypes that can be hard to navigate. Both sides of the debate point to some important lessons on human interaction in the digital age. Meeting people online could be a real risk to your safety – but so could meeting the wrong person in a bar, and for some dating on the web provides protection from discrimination. There is no ‘best’ way to find love in the 21st century, but online dating is certainly one that has worked for many people, besides also being fun. For the cynics, remember that some good dating sites are free, meaning that taking a chance on online romance needn’t cost you a penny. I first met Heather the owner of Art Junkie Designs on Twitter.? She is also a Graphic Designer & Illustrator for her own company.? Heather offered to be a sponsor for my recent Valentines Giveaway Bash (which was a huge hit by the way!).? Here is what Heather donated for the giveaway, isn’t it great? 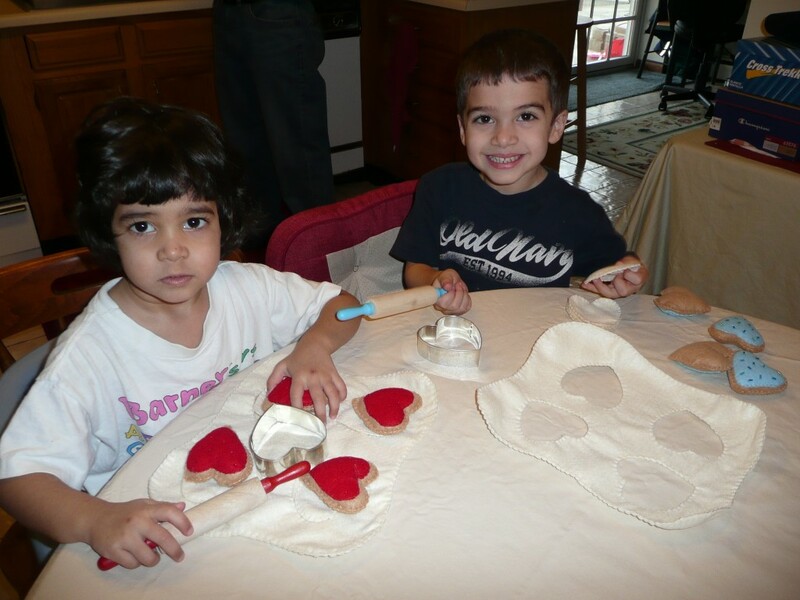 After the giveaway was over, I decided to contact Heather and ask her to make 2 Felt Cookie Sets for each of my children.? One set in red for my daughter and one set in blue for my son.? They were at my door so fast and just in time for Valentine’s Day! And as many of you know, being an artist myself – I always pay attention to the small details.? The first detail I noticed about the sets was that they were packaged so beautifully!? They even had little heart confetti inside the packaging.?? Another really cool detail was the pretend dough – it was rolled and wrapped in saran wrap as if it were actual dough waiting to be cut out with a cookie cutter. 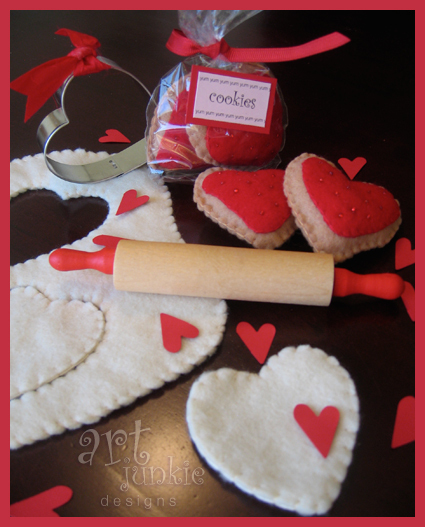 In each set was a heart shaped cookie cutter, 4 heart shaped cookies with frosting and sead bead sprinkles (my favorite part), a rolling pin, and rolled out dough with 4 heart cookie cutouts. 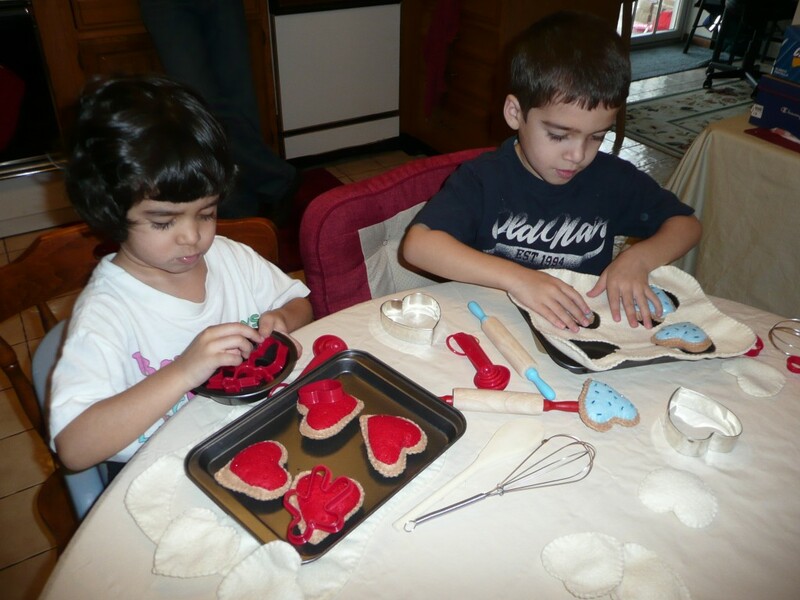 Everything your little baker needs to create their own deliciously sweet cookies.? 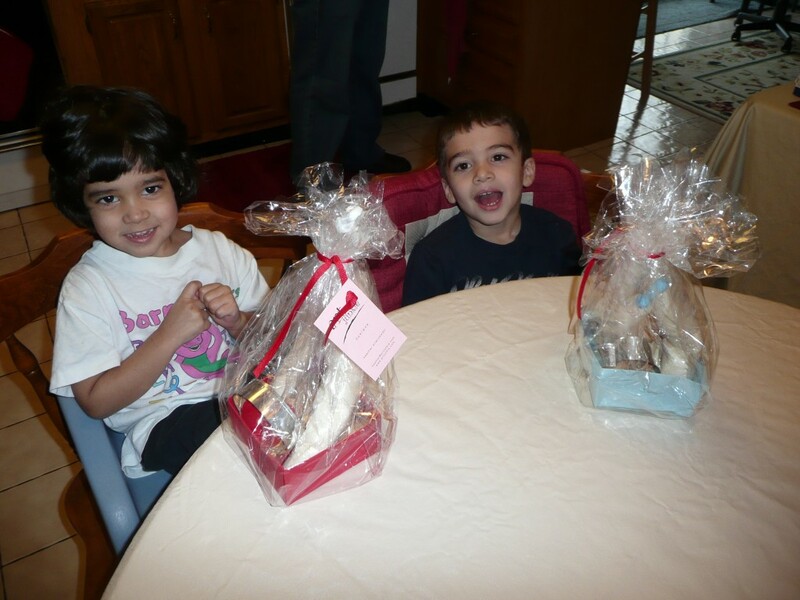 They can roll out the dough, punch out the cookies, bake and serve – just like mom! When I first ordered the sets, Heather also told me about a great sale that was going on at Bed Bath & Beyond for kid’s baking sets.? They were only $2.99 each and came with the baking sheet, apron (which my kids refused to wear for the picture), cookie cutters, mixing bowl, etc.? What a deal!? I was so excited! Here are the cookie sets in action! You can purchase your own set for only $14 a piece!? Click Here to order! Or you can learn how to Do It Yourself, but I would really suggest for you to purchase your own set from Heather because she does such a great job!